Glossy light green small spheres from deposit Parýz. Found in the year 1993. 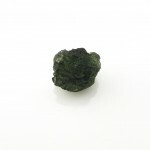 The moldavites weigh 2.8 and 2.9g (14 and 14.5ct). 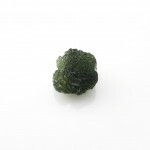 The ball (sphere) shape is full-form type of moldavite shape. 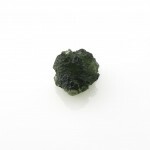 Spheres are rare – only about one tenth percent of all moldavites. I have found Moldavite in Texas. Do you know what time the asteroid hit the earth that created these gems?? 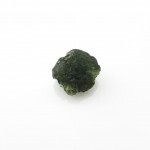 Isn’t it factual that the Only tektites that are green (esp. when backlit) are moldavites? And I live in East Texas which is the location of the find. The larger of the two weights 12 grams while the smaller weights 3 grams. Also located in the area, are Paleo Indian artifacts, including numerous stone tools and worked fossilized shells. The area that was inhabited by these people covers several miles along a very old and deeply carved creek. I Greatly Appreciate your response!!! If you could perhaps refer me to a reputable scientist or a professional whom can assist my search further I would be very grateful. And, once again, my deepest thanks!!! Georgiaites are green too (olive-green), but they are from East-central Georgia (24 Confirmed Counties), two South Carolina counties. Could you send me some photos of your stones? (email address in http://www.aboutmoldavites.com/contact/).